Happy Easter to all! Next issue of free GUNNER24 Newsletter is published and mailed on April 28th! After predicting the probable short- and medium-term course of the Dow Jones Industrial Average last Sunday, today I am devoting myself to the DAX/FDAX on special trader request. So that also the European-based traders can get a rough idea of how much potential in terms of price and time their European Stock Market indices should still have until the next medium-term highs are likely. 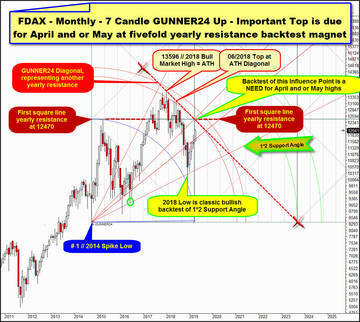 Like always, for my DAX analysis, I refer to charts of the DAX futures contract FDAX. Seize your daily profits with quick and safe short-term trades! For every trading day, you’ll get the most profitable trade out of the following pool: S&P 500, the NASDAQ-100, Dow Jones, DAX, the FTSE 100 and Nikkei 225 as well as gold, silver, platinum, copper, oil, EUR/USD, $, €, ¥, £ and the worldwide hottest stocks. A daily alert-e-mail will be sent to the traders. Additional sending follows in case of urgent call for action.